Matthew 27:33 They came to a place called "Golgotha," that is to say, "The place of a skull." Mark 15:22 They brought him to the place called Golgotha, which is, being interpreted, "The place of a skull." Luke 23:33 When they came to the place that is called The Skull, they crucified him there with the criminals, one on the right and the other on the left. John 19:17 He went out, bearing his cross, to the place called "The Place of a Skull," which is called in Hebrew, "Golgotha,"
gol'-go-tha (Golgotha, from "a skull"): In three references (Matthew 27:33 Mark 15:22 John 19:17) it is interpreted to mean kraniou topos, "the place of a skull." In Luke 23:33 the King James Version it is called "Calvary," but in the Revised Version (British and American) simply "The skull." 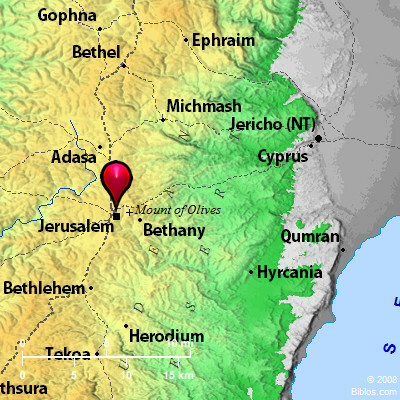 From the New Testament we may gather that it was outside the city (Hebrews 13:12), but close to it (John 19:20), apparently near some public thoroughfare (Matthew 27:39), coming from the country (Mark 15:21). was a spot visible, from some points, from afar (Mark 15:40 Luke 23:49). (1) That it was a spot where skulls were to be found lying about and probably, therefore, a public place of execution. This tradition apparently originates with Jerome (346-420 A.D.), who refers to (3), to condemn it, and says that "outside the city and without the gate there are places wherein the heads of condemned criminals are cut off and which have obtained the name of Calvary-that is, of the beheaded." This view has been adopted by several later writers. Against it may be urged that there is no shadow of evidence that there was any special place for Jewish executions in the 1st century, and that, if there were, the corpses could have been allowed burial (Matthew 27:58 John 19:38), in conformity with Jewish law (Deuteronomy 21:23) and with normal custom (Josephus, BJ, IV, v, 2). (2) That the name was due to the skull-like shape of the hill-a modern popular view. No early or Greek writer suggests such an idea, and there is no evidence from the Gospels that the Crucifixion occurred on a raised place at all. Indeed Epiphanius (4th century) expressly says: "There is nothing to be seen on the place resembling this name; for it is not situated upon a height that it should be called (the place) of a skull, answering to the place of the head in the human body." It is true that the tradition embodied in the name Mons Calvary appears as early as the 4th century, and is materialized in the traditional site of the Crucifixion in the church of the Holy Sepulcher, but that the hill was skull-like in form is quite a modern idea. Guthe combines (2) and (3) and considers that a natural skull-like elevation came to be considered, by some folklore ideas, to be the skull of the first man. One of the strangest ideas is that of the late General Gordon, who thought that the resemblance to a skull lay in the contours of the ground as laid down in the ordinance survey map of Jerusalem. (3) That the name is due to an ancient pre-Christian tradition that the skull of Adam was found there. The first mention of this is by Origen (185-253 A.D.), who himself lived in Jerusalem 20 years. He writes: "I have received a tradition to the effect that the body of Adam, the first man, was buried upon the spot where Christ was crucified," etc. This tradition was afterward referred to by Athanasius, Epiphanius, Basil of Caesarea, Chrysostom and other later writers. The tomb and skull of Adam, still pointed out in an excavated chamber below the traditional Calvary, marks the survival of this tradition on the spot. This is by far the most ancient explanation of the name Golgotha and, in spite of the absurdity of the original tradition about Adam, is probably the true one. (4) The highly improbable theory that the Capitolium of AElia Capitolina (the name given by Hadrian to his new Jerusalem) stood where the Church of the Holy Sepulcher now is, and gave rise to the name Golgotha, is one which involves the idea that the site first received the name Golgotha in the 2nd century, and that all the references in the Gospels were inserted then. This is only mentioned to be dismissed as incompatible with history and common sense. (2) that a prominent, rounded, grassy hill above the so-called "Grotto of Jeremiah," Northeast of the Modern Damascus Gate, has at least a very high probability of being the true site. It is impossible here to go into the whole question, which requires minute and long elaboration, but excellent review of the whole evidence may be consulted in "Golgotha and the Holy Sepulcher," by the late Sir Charles W. Wilson, of PEF. Here only a few points can be touched upon. (1) For the traditional view it may be said that it seems highly improbable that so sacred a spot as this, particularly the empty tomb, could have been entirely forgotten. Although it is true that Jews and Christians were driven out of Jerusalem after the second great revolt (130-33 A.D.), yet GentileChristians were free to return, and there was no break long enough to account for a site like this being entirely lost. Indeed there are traditions that this site was deliberately defiled by pagan buildings to annoy the Christians. Eusebius, at the time of Constantine, writes as if it were well known that a Temple of Aphrodite lay over the tomb. He gives an account of the discovery of the spots still venerated as the Golgotha and the Tomb, and of the erection of churches in connection with them (Life of Constantine, III, 25-40). From the time of Constantine there has been no break in the reverence paid to these places. Of the earlier evidence Sir C. Wilson admits (loc. cit.) that "the tradition is so precarious and the evidence is undoubtedly so unsatisfactory as to raise serious doubts." The topographical difficulties are dealt with in the JERUSALEM. It is difficult for the visitor to Jerusalem sufficiently to realize that the center of gravity of the city has much changed; once it was on the Hill Ophel, and the southern slopes, now bare, were in Christ's time crammed with houses; in later times, from the 4th century, it was the Church of the Holy Sepulcher round which the city tended to center. There is no insurmountable difficulty in believing that the site of the Crucifixion may be where tradition points out. As Sir C. Wilson says at the end of his book, "No objection urged against the sites (i.e. Golgotha and the Tomb) is of such a convincing nature that it need disturb the minds of those who accept, in all good faith, the authenticity of the places which are hallowed by the prayers of countless pilgrims since the days of Constantine" (loc. cit.). (a) its conspicuous and elevated position-a position which must impress every reverent pilgrim as strikingly suitable for an imaginary reconstruction of the scene. The very greenness of the hill-it is the first green spot in the neighborhood of the city-may influence the subconsciousness of those who have been brought up from childhood to think of the "green hill far away," as the popular hymn puts it. When, however, we consider the question historically, there is not the slightest reason to expect that the crucifixion of Jesus, one of many hundreds, should have been dramatically located in a setting so consonant with the importance with which the world has since learned to regard the event. There is no evidence whatever that the crucifixion was on a hill, much less on such a conspicuous place. (b) The supposed resemblance to a human skull strikes many people, but it may be stated without hesitation that the most arresting points of the resemblance, the "eyeholes" and the rounded top, are not ancient; the former are due to artificial excavations going back perhaps a couple of centuries. Probably the whole formation of the hill, the sharp scarp to the South and the 10 or more feet of earth accumulated on the summit are both entirely new conditions since New Testament times. (c) The nearness of the city walls and the great North road which make the site so appropriate today are quite different conditions from those in New Testament times. It is only if the present North wall can be proved to be on the line of the second wall that the argument holds good. On this see JERUSALEM. (d) An argument has been based upon a supposed tradition that this spot was the Jewish place of stoning. This so-called tradition is worthless, and not a trace of it can be found outside interested circles, and even if it were the "place of stoning," it would be no argument for its being "Golgotha." To the Oriental, with his great respect for traditional sites, the church of the Holy Sepulcher, covering at once the Tomb, the Calvary, and other sacred spots, will probably always appeal as the appropriate spot: to the western tourist who wishes to visualize in the environs of Jerusalem in an appropriate setting the great world's tragedy, such a site as this "Skull Hill" must always make the greater appeal to his imagination, and both may find religious satisfaction in their ideas; but cold reason, reviewing the pro's and con's, is obliged to say "not proven" to both, with perhaps an admission of the stronger case for the traditional spot. Golgotha, a hill near Jer.